The single best way to ensure that your power wheelchair or scooter remains in operable condition is to maintain it. Preventive maintenance can greatly reduce the risk of unexpected failures and the need for repairs. However, you may not know how best to care for your wheelchair. Worry no longer, as we've got some simple and helpful tips that you can follow. Read further below! Controller – This electronic control unit transmits your inputs into motion. Though you may not be able to maintain your controller (unless you happen to possess an electrical or computer engineering degree), it's still beneficial to know what it is and what it does. Motor – The electric motor is what converts electrical power into mechanical power. 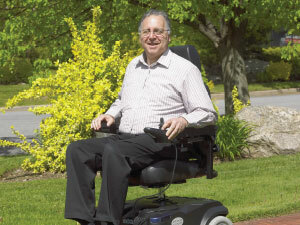 Of the components on your wheelchair, the motor and batteries are the largest and most important. Batteries – Instead of gasoline, your power wheelchair runs on electricity, which is provided by the batteries. Replacing the batteries based on a set schedule, and being sure to keep them properly charged, can help ensure you don't run out of "juice" when you're least expecting it. Tires and Wheels – Keeping your tires properly inflated will help ensure smooth running at all times. When the repair is simply too big for you to accomplish on your own, we are here to help. To arrange an appointment with Dynamic Repair Solutions, simply contact us. We can be reached via email or telephone and are always happy to answer your questions!